It is with great pride that I share with you my vision for Washington High School. As the Principal of Washington my focus is to help create a nurturing environment that supports all learners to succeed far beyond high school developing a pipeline to career and college. With that in mind, I will build upon WHS traditions by continuing to create and document school-wide systems especially those supported by community partnerships. · Social emotional supports are important. · Learning is a life-long process. · Relationships need to be nurtured. · Learners should be supported by adults who have the passion to want to make a difference. As we continue to move forward throughout this year, I believe with focused goals WHS can be the connection to the future where potential is limitless! 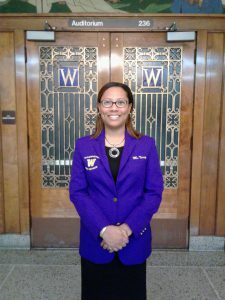 As a native Milwaukeean and proud MPS graduate, Angelena Terry has worked in education for 27 years. During those 27 years she has worked at all educational levels teaching from early childhood through college. Ms. Terry has been a classroom teacher, literacy coach and science lab teacher, and assistant principal. She uses all that she has learned and experienced to create a well-rounded view of teaching and learning. She is passionate about students and making a difference in each child’s life. She holds three college degrees. As she reflects on being the principal of Washington High School she knows that this is a wonderful opportunity for her to continue to learn but also to work endlessly for the benefit of students, families, and WHS commmunity and the WHS staff. Ms. Terry keeps a smile on her face and loves her job as the principal. She believes that WHSoIT is moving in the right direction and challenges us all to be the best in all that we do.